In a time when lens manufacturers, including Tamron, are pushing boundaries back, it is interesting to see Tamron introduce a new lens with the same name as the previous lens, requiring the model number to be included in references for differentiation. Also interesting is Tamron's shotgun focal length targeting. Tamron not long prior introduced a pair of similar lenses with not-greatly-dissimilar focal lengths, 35mm and 45mm. Now simultaneously introduced are another pair of similar focal length lenses, 85mm and 90mm. While the first pair of lenses referred to involved nearly identical lens specs, the second has more variation. A keyword in the 90's model name is "Macro". While that word in a lens name does not always hold great value, this lens is the real deal – it has a true 1:1 maximum reproduction ratio or 1x maximum magnification. The 90 VC can be used at focus distances as far as infinity as normal lenses can, but this lens’ close-focus capability can make your tiny subjects appear very large in the frame. The other variation in this lens (vs. the 85) is the max aperture, with the 90 featuring a narrower f/2.8 max opening. Otherwise, all 4 of the referenced lenses appear to be part of the same family, sharing many positive design similarities including Vibration Compensation (VC). As always, focal length drives perspective and subject framing. 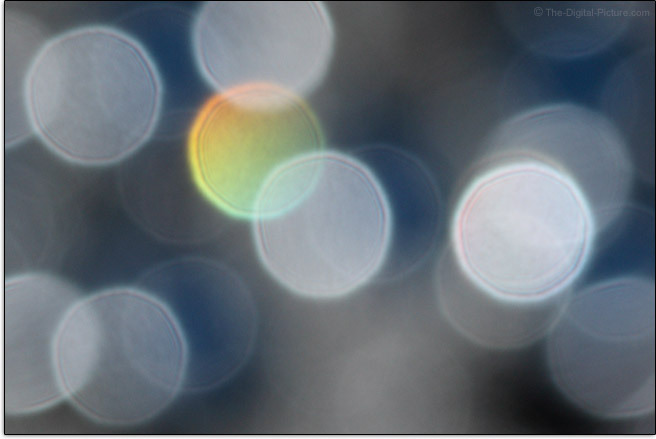 Therefore, making focal length the primary driver for lens selection makes great sense. One of this lens' most desirable features is its macro capability and especially relevant to macro photography (with 1:1/1x-capable lenses) is the working distance provided by this focal length at this magnification. The longer the focal length, the more 1:1 working distance is available and the less likely that little living creatures such as insects will be frightened away while/before being photographed. In this regard, 90mm is slightly wider than the average for macro lenses. The difference between 90mm and 100mm or 105mm is slight. The difference between 90mm and 180mm or similar is big. Another consideration especially relevant to macro photography is how much background the focal length takes in (based on angle of view) and how much that background is compressed and magnified (resulting in blur). I'll talk more about background blur soon, but once again, this lens is just slightly wider than average for macro lenses. You get slightly more background in the frame with slightly less background blur than the common 100mm and 105mm options. The difference in this regard between 90mm and 180mm is, again, large. I doubt that anyone could complile a complete list of subjects available for a macro lens regardless of focal length and 90mm falls into approximately the middle of them all. Great little macro subjects abound – they are everywhere. Insects, spiders, plants, food and candy, coins, jewelry, craft items and supplies, commercial products, etc. Bringing home flowers for your spouse (AKA photo subjects) may help them enjoy (support) your macro photography pursuits more. Simply walking around outside of your house will surely turn up interesting things to focus on. While many look at a macro lens as being specific for close-up photography, nearly all macro lenses, including this one, work very well for many other purposes compatible with their focal length. The short telephoto 90mm focal length has a host of useful applications. One of the primary applications for a 90mm lens is portraiture. The 90mm focal length provides a great perspective for all types of portraits, especially for individual portraits ranging from moderately-tightly cropped head shots to as widely-framed as you have working space for. 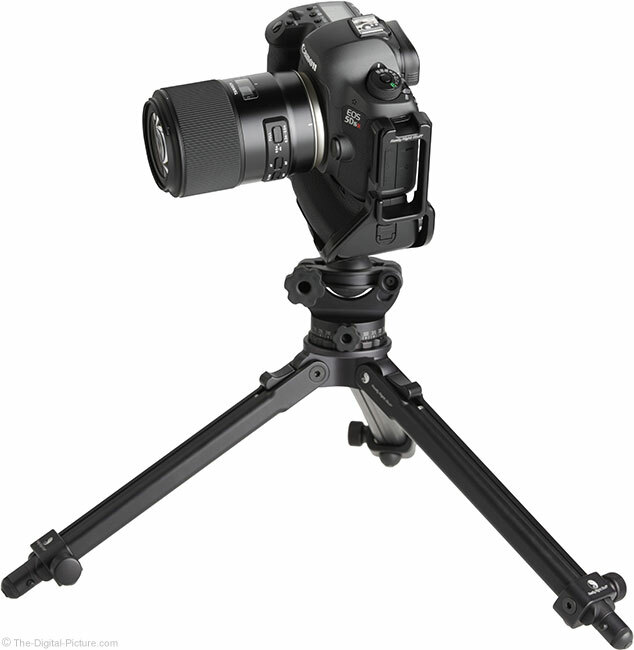 With adequate working space, small group and family portraits are easily within this lens' capabilities. The utility of a 90mm macro lens is great at weddings, capturing details of a dress one minute, portraits next and photos of the rings moments later without a lens change required. Keep in mind that, while the stock image market continues to plunge the value of many types of images, it has no affect on the portrait image market. While many sports are best captured with very long focal length lenses, not all require such and you may find a 90mm lens ideal for some sports. The 90mm focal length (like most others), can be successfully used for landscape photography. 90mm also works very well for commercial and general studio photography applications along with a wide range of other uses that I won't bore you by listing. Utilizing a smaller image circle means that APS-C sensor format cameras frame a scene more tightly, with 1.6x being the multiplier (FOVCF) used to determine the full frame angle of view equivalent. Multiplying 90mm by 1.6x yields 144mm as the angle of view equivalent for this lens. This tighter angle of view is useful for similar purposes as just described, though the longer working distance favors macro work but not large products, and favors tightly framed portraits but not group portraits. While an f/2.8 aperture is not especially wide for prime lenses around this focal length, f/2.8 is very common for the macro prime lens options and f/2.8 is a relatively wide/fast aperture. This lens is capable of stopping action in relatively low light levels and f/2.8 is wide enough to both provide a bright viewfinder and to enable the higher precision AF capabilities (most often the center AF point) in some DSLR cameras. If the f/2.8 DOF (Depth of Field) is adequate for your goals, convenient is that this lens can be used handheld in even modestly low light levels without resorting to very high/noisy ISO settings. In combination with the short telephoto focal length, f/2.8 permits a very strong, subject-isolating background blur. Here are two examples of what this lens' apertures (through f/16) look like with one showing very close focusing and one more distant focusing. 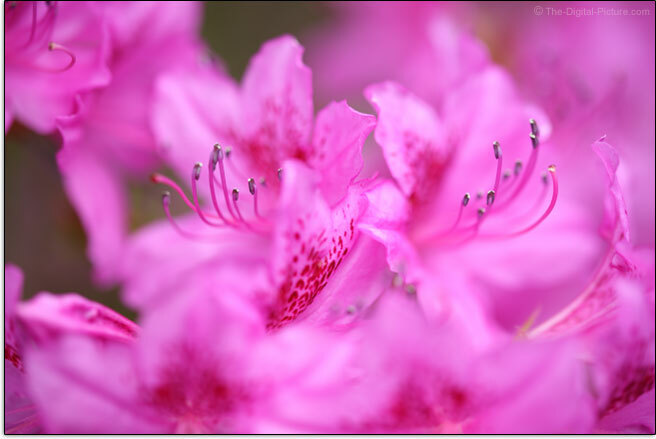 Notice how your eye is drawn to the azalea stamen in the first f/2.8 example relative to the f/16 example. 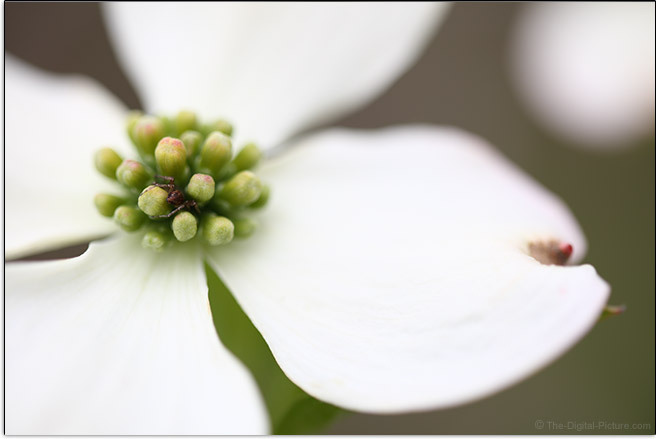 The white dogwood flowers similarly attract a viewer's eye in the second f/2.8 example relative to the f/16 example. Don't get me wrong – there are many times when I want the entire image to be in focus, but having the ability to completely blur the background is not a capability of all lenses. Those of you considering a 180mm f/2.8 macro lens option should keep in mind that the longer lens can create an even much stronger blur. 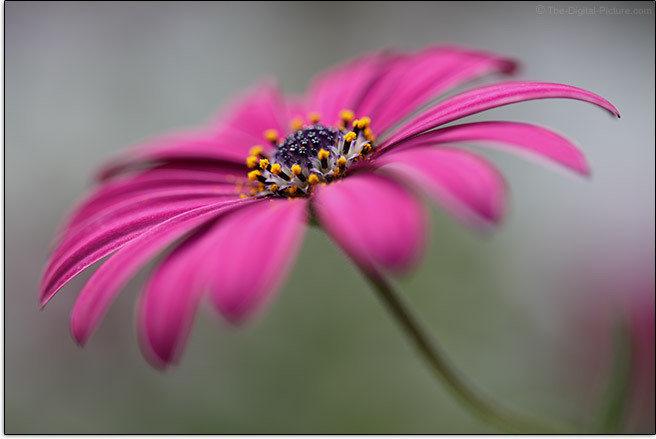 While talking about the available apertures of a macro lens, it should be mentioned that, at very close focusing distances, the max aperture decreases. If using auto exposure, the camera will automatically account for this. If using a manual exposure, it is you that is accountable for adjusting the exposure. This attribute is not unique to Tamron or any other brand macro lens, but ... it is annoying to dial in a manual exposure, change focusing distances and realize that your settings are no longer right. Aiding greatly for handholding this lens is Vibration Compensation (VC, Tamron's term for image stabilization). While VC is not going to stop floura from blowing in the wind or bees from flying, it aids greatly in stopping camera shake and makes handheld subject framing much easier. 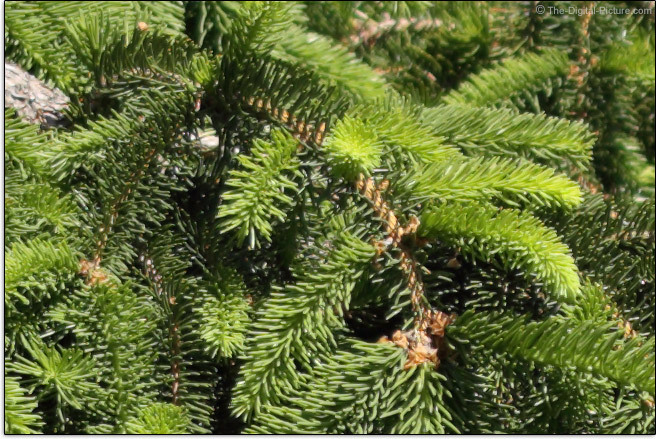 The subject framing improvement is especially helpful at close distance/high magnification. When you need to leave the tripod behind, VC is there for you and with VC, this is an even better walkaround lens. As with Tamron's other recent VC lens introductions, this VC implementation is very quiet with a light clicking being audible on startup and shutdown and with only a very faint hum heard while activated. In this lens, VC activation does not cause the viewfinder image to jump and it makes a very noticeable difference in the stability of the image in the viewfinder, with the scene becoming very still. Tamron does not list a number of stops rating for this VC implementation, and your experience will vary depending on your circumstances, your capabilities, the camera used and the pixel density of its sensor. Under optimal conditions (solid floor indoors), I was getting a decent keeper rate with exposures as long as 1/10 second for approximately 3.5 stops of assistance for me. The percentage of sharp photos dropped rather abruptly with long exposures, but usably-sharp images were captured at exposures as long as 1/4 second. Note that VC will provide a bit less assistance (at least a stop less) at very close focusing distances, but that assistance remains very helpful. When assessing the image quality of a lens, most will look first at the sharpness a lens delivers. And, this lens delivers very nicely in this regard. Tamron 90mm VC Lens images at f/2.8 are quite sharp from corner to corner and razor sharp when stopped down to f/4. From a sharpness perspective, there is little reason to stop down to f/5.6 aside from a modest improvement showing in the very extreme corners. The Canon EOS-1Ds Mark III (21.1 megapixel, 6.4µm pixel size) shows the f/2.8 to f/4 sharpness difference and the difference is, as expected, more obvious on the ultra-high resolution Canon EOS 5Ds R (50.6 megapixel, 4.14µm pixel size). Still, f/2.8 results are very usable even on the 5Ds R, especially with a little sharpening added. Following is a set of comparison images. These are center-of-the-frame 100% crops captured with 5Ds R. The RAW images were processed in DPP using the Standard Picture Style with sharpness set to "1" (very low) and cropped to 100% resolution. The following examples are from the center of the frame. Don't let the increasing depth of field influence your view on this comparison. 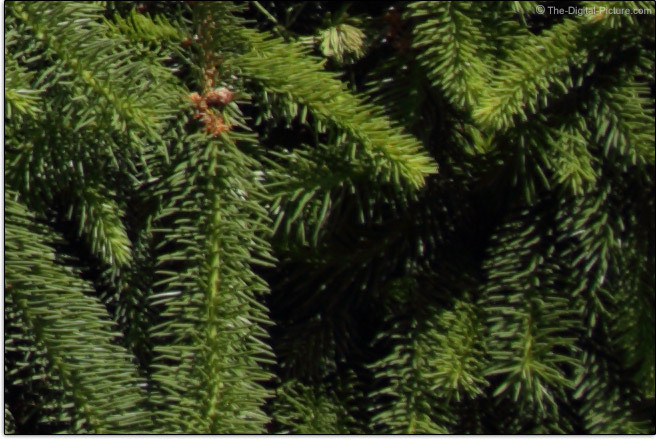 Find the areas of the image that show the least amount of change between apertures to find the center of DOF (Depth of Field). As expected, the resolution and contrast of the f/4 sample is better than the f/2.8 sample, but the f/2.8 image is sharp, especially with some modest sharpening applied. You will have to look really hard to see any difference between f/4 and f/5.6 at the center of the DOF. Moving to the extreme 5Ds R corners, the furthermost portion of the image circle utilized, we see, relatively speaking, very good wide open performance. At this extremity, stopping down to f/5.6 shows a bit of improvement, but vignetting must be accounted for at this location in the frame. The Tamron 90 VC has a normal amount of vignetting with about 2 stops of corner darkening apparent at f/2.8. That amount is cut in half at f/4 and at least in half again at f/5.6 where a negligible approximately .2 stops remain. By f/8, there is practically no peripheral shading even in a contour-marked test image looking for the tiniest changes. Using a silver bracelet as the subject, the next test looks for axial (longitudinal, bokeh) CA and spherical aberration. The fringing colors in the foreground and background at f/2.8 (and mostly disappearing as depth of field increases at f/4) shows that these rather common aberrations are present to an extent. The Tamron 90 VC controls flare remarkably well, especially for a telephoto lens. Even at f/16 with the sun in the corner of the frame, there are only minor flare effects showing in the image. Prime lenses usually have only a small amount of linear distortion at most and this one has a negligible amount. A straight line running along the edge of the frame, such as the window frame below, is unforgiving in its ability to reveal distortion. This example shows that there are no distortion concerns with the Tamron 90 VC. Also looking nice is bokeh. 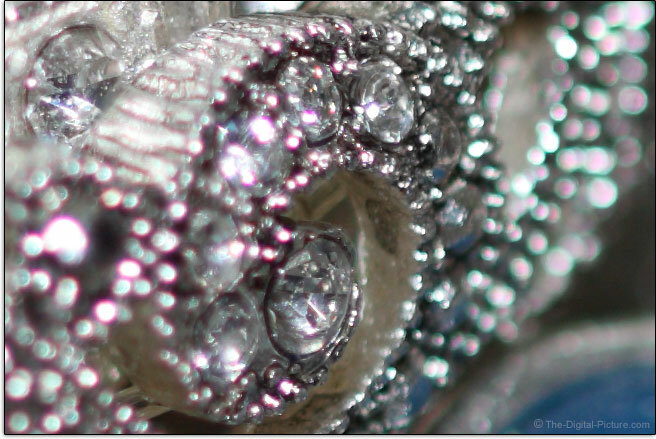 Here is a 50%-reduced sample of the Tamron 90 VC's f/5.6 rendering of out of focus specular highlights. The centers of these circles are especially smooth. 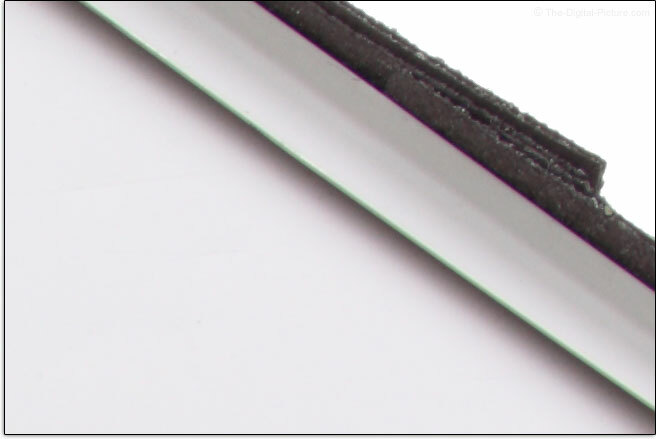 Most lenses being introduced at this time have an odd (vs. even) number of aperture blades. Having an odd number is usually considered an advantage because distant point light sources showing a star-like effect will have 2x as many points as blades instead of the same number as when an even blade count is used. 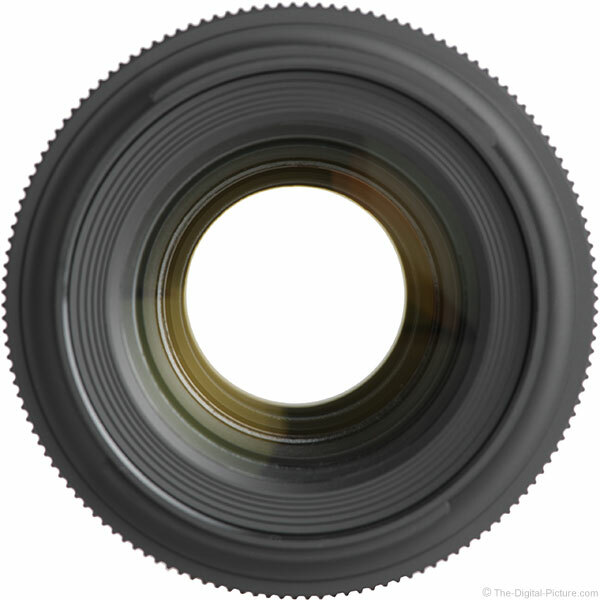 Look for 18-point stars being created from this lens' 9 blade diaphragm. When the Tamron 90mm f/2.8 VC USD Lens first arrived, I had a couple of opportunities to use it before fully testing it. That is not usually my practice, but ... I took a chance on this one. I had no regrets – I was not disappointed in my results. The image quality this lens delivers is quite good. The Tamron 90 VC, like the other 3-most-recently-introduced Tamron lenses, features a very quiet ring-type USD (Ultrasonic Drive) autofocus motor. With an ear next to the lens, only some light clicks are heard during AF. This lens focuses with good speed and, with an inner focusing and floating system design, does not extend during focusing. FTM (Full Time Manual) focusing is supported without a switch change. In One Shot AF mode, focus accuracy has been very good. Following are ten 100% resolution EOS 5Ds R crops taken from consecutive images captured from a de-focused AF position at f/2.8 (with very low sharpening). 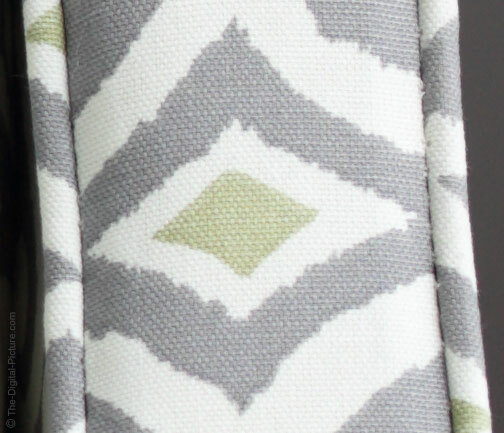 It is hard to see much difference between these samples and ... that is exactly what we want to see. 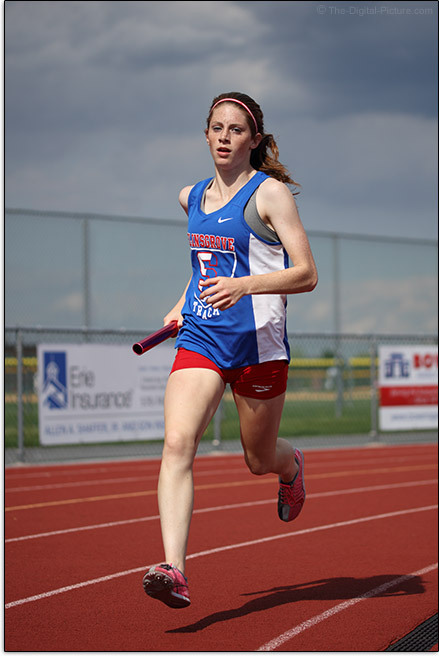 I mentioned using the Tamron 90 VC for real world subjects prior to testing the lens and one such use was at a track meet. A track meet is all about action and tracking action in AI Servo focusing mode is far more challenging to a camera and lens system than focusing on a still subject in One Shot mode. While not the best lens I've used in this scenario, the Tamron 90 VC performed quite well, delivering a good percentage of sharp faces. An autofocus distance range selection switch offers Full, 1.64'(0.5m) - ∞ and 0.98'(0.3m) - 1.64'(0.5m) ranges. Selecting a range less than Full can improve AF performance within that range, especially when shooting close-up. Note that subject framing changes significantly with focus distance changes. When adjusting subject distance for framing purposes, focus should be continuously adjusted. It's been a long time since I've reviewed a lens that rotated the front filter threads during focusing (and I'll likely stop mentioning the lack of this characteristic in future reviews). The Tamron 90 VC also does not rotate the filter threads. Most better grade lenses made today have a focus distance scale (in both ft and m) and most autofocus lenses place that scale in a window on the lens. This one has the same and adds a reproduction ratio scale, showing the focus distances required for 1:1, 1:1.2, 1:1.5, 1:2, 1:3, 1:5 and 1:10. The Tamron 90 VC has a wide 207° focus ring rotation, but it needs all of that to provide for precise focusing at all focus distances. While this rotation is just slow enough for precision, a slight slip-stick behavior slightly aggravates precise manual focusing. 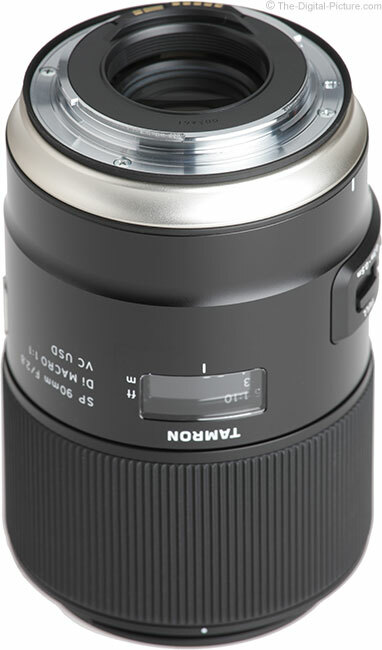 For telephoto prime lenses in general, the Tamron 90 VC has an extremely short MFD (Minimum Focus Distance) and high MM (Maximum Magnification). For true macro lenses, the 1:1/1x maximum reproduction ratio/MM spec is normal. Normal or not, this feature is extremely useful and adds very significantly to this lens' versatility (and fun). A subject can be rendered life-sized on your sensor. Of course, when viewed on a computer display or print, it will likely be FAR larger than life-size. If 1x MM is not enough for you, mount an extension tube behind this lens. Note that infinity and long distance focusing are sacrificed with an ET in use, but with an even shorter focus distance enabled, ETs can increase MM nicely. This lens is compatible with Tamron Pro teleconverters. Mounting a 1.4x or 2x teleconverter behind this lens creates a 126mm f/4 VC lens or 180mm f/5.6 VC lens with 1.4x and 2.0x MM respectively. Expect reduced AF speed and a noticeable impact on wide open aperture image sharpness with the 1.4x teleconverter and even more reductions with the 2x. Stopping down at least one stop brings a marked improvement in sharpness when teleconverters are mounted. Place the last 4 Tamron lenses to hit the market as of review time beside each other and the family resemblance is easily recognizable. 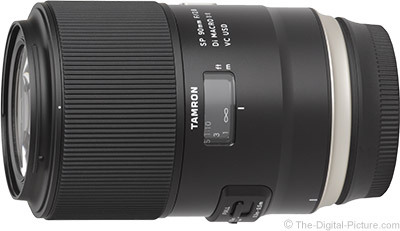 Tamron's latest lens design is really nice, featuring an attractive, clean and modern appearance. I'm not at all disappointed to see another lens coming from this mold. Obvious is that the Tamron 90mm f/2.8 Di VC USD Lens is longer than its siblings, with a longer focus ring and slightly longer barrel. While the other three lenses have an f/1.8 max aperture, the 90mm f/2.8 is the only family member with the 1x macro capability. These lenses all have an aluminum alloy barrel with a semi-gloss black finish that looks great next to the matte rubber focus ring and matte plastic lens hood. 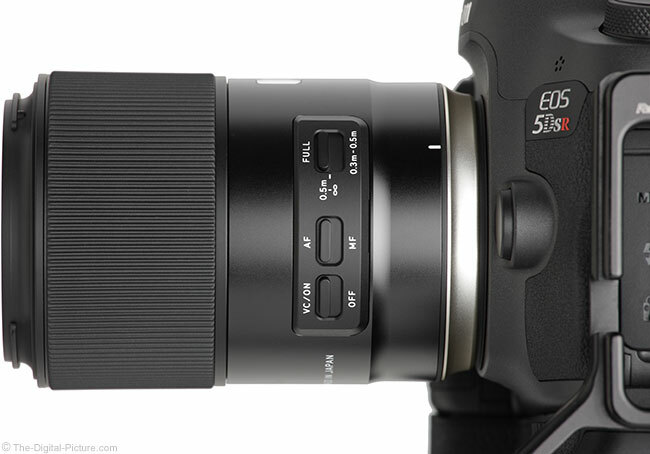 Here are the standard product image views of this lens. Like its siblings, the 90 VC is a fixed-size lens with a smooth overall design that feels great in hand. The large focus ring is easy to find and use. The three switches (Focus Limiter, AF/MF and VC On/Off) reside on a slightly-raised panel on the left side of the lens. The switch panel is nicely contoured to the lens barrel. This switch placement position is very convenient to reach with the left thumb during use. The switches are very adequately sized with a sufficient amount of throw and a positive click to provide strong positional tactile feedback. There is no question about which position the switches are in with the 3-position focus limiter switch being slightly more challenging. Having three switches (vs. 2 on the other Tamron lenses being mentioned here) causes me a slight pause to insure I'm changing the right one. 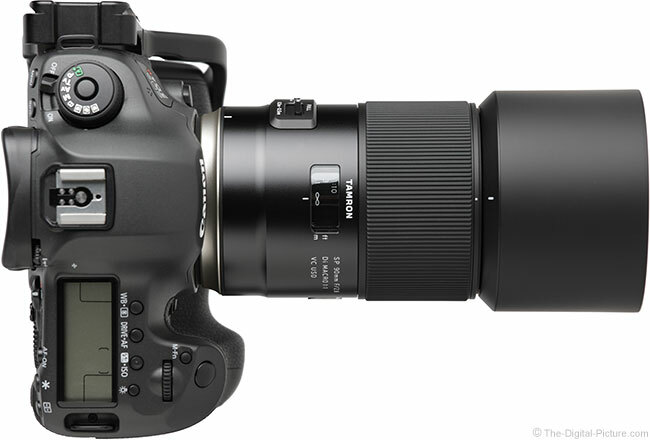 For many more comparisons, review the complete Tamron 90mm f/2.8 Di VC USD Macro Lens Specifications using the site's Lens Spec tool. 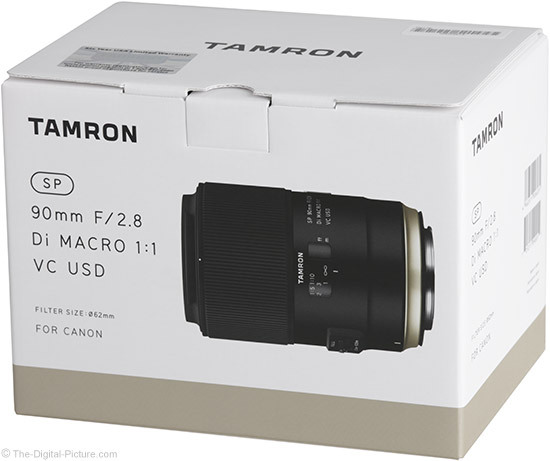 Use the site's product image comparison tool to visually compare the Tamron 90mm f/2.8 Di VC USD Macro F017 Lens to many other lenses. I have a rather extensive set of filters, but ... 62mm is very under-represented in my kit. Nikon, Sigma and Tamron have a handful of lenses with a 62mm filter size, but Canon does not have even one. Positive features of 62mm filters are small size and low cost. If you would rather not add 62mm filters to your kit, a step-up filter adapter ring is a low cost option for adapting larger filters to 62mm. The Tamron HF017 lens hood is included in the box. Aside from a slight outward flare at the base, this semi-rigid plastic hood is straight. While it is large enough to provide good front element protection from bright light and impact, it stores very compactly when attached in reverse orientation. As expected, the Tamron 90 VC comes in a newly-designed box similar to its sibling's boxes and comes with the review-time-latest lens cap design. 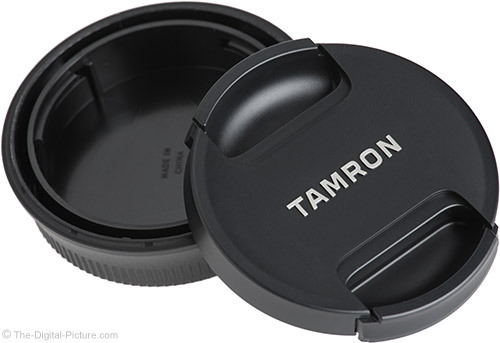 While Tamron's larger diameter lens mount cap does not align exactly with a Canon body cap (the best way to store body and mount caps is connected), it better protects the lens' rear weather sealing gasket. No lens case is included in the box, but especially with the compact reversed lens hood, finding somewhere to stow this lens should not be challenging. Lowepro's Lens Cases get my vote as very nice and affordable solutions for single lens storage, transport and carry. 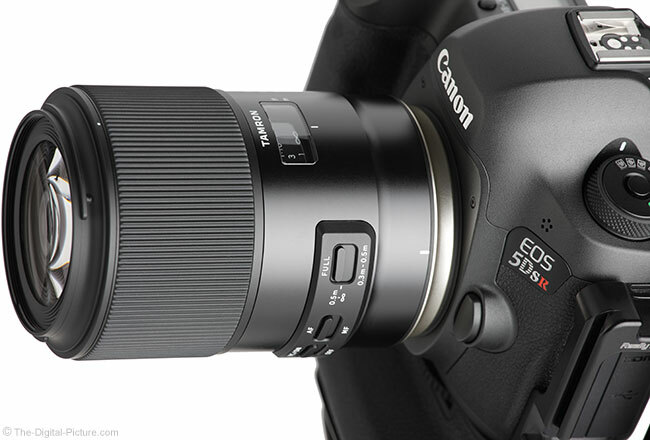 Big news is that this lens is compatible with the optional Tamron TAP-in Console, a computer-attached dock used for fine-tuning focusing performance and updating the lens firmware. The TAP-in Console was not available at review time, but this will surely be a great accessory to have. Having only a modestly-wide aperture, no zoom range design complexity and plenty of competition between manufacturers keeps most of the short telephoto macro lenses reasonably affordably priced and the regular price for this lens is a bargain. For the fun and versatility this lens can add to the kit, the price is quite low. 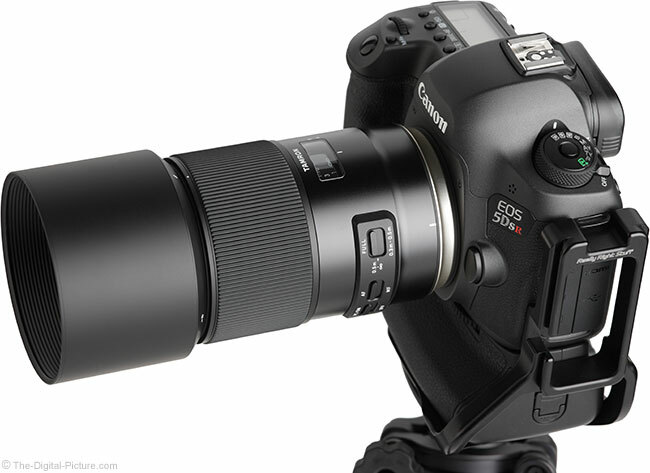 The Tamron 90mm f/2.8 Di VC USD Lens is available in Canon EF (reviewed), Nikon F and Sony A (no VC). My standard disclaimer: There are potential issues with third party lenses. Since Tamron reverse engineers (vs. licenses) manufacturer algorithms, there is always the possibility that a DSLR body might not support a (likely older) third party lens. 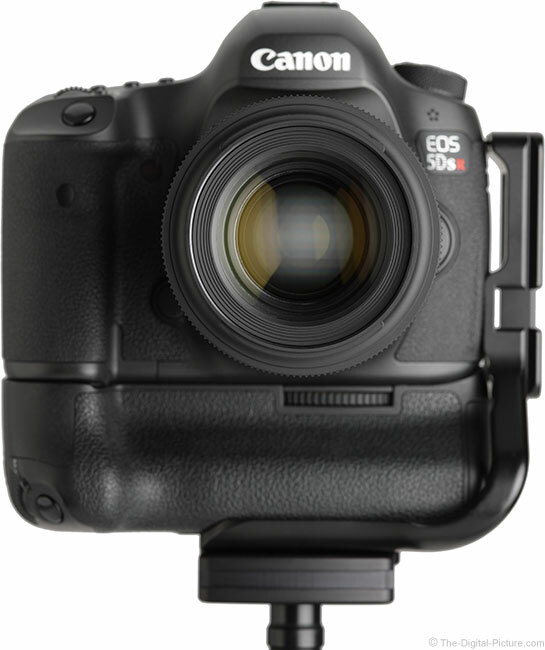 Usually a lens can be made compatible by the manufacturer via a firmware update. While this cannot be guaranteed, the previously-mentioned Tamron Tap-in Console makes firmware updates easy for this lens. There is also the risk of a problem that results in the lens and body manufacturers directing blame at each other. That Tamron USA has your back for 6 years (the warranty period) is impressive. The reviewed Tamron 90mm VC Macro lens was retail/online-sourced. It seems that such a short telephoto macro lens is requisite for a manufacturer's lens lineup and the competition in this space is strong. Deciding between the various models is ... not so easy. Here are some macro lens comparisons (using the site's image quality tool) that you may find interesting. CTRL-Click on each link to open a comparison in a new tab, saving your place here. The biggest difference you will see in these comparisons is against the very inexpensive Tokina 100. I suggest spending the extra to get the Tamron 90 VC over this lens. Perhaps the next biggest comparison difference is against the Zeiss Milvus 100. The Zeiss is an extremely well-built lens and it performs better optically at f/2.8. These two lenses have some other significant differences that must be considered. The Zeiss has a 1-stop-wider f/2 aperture available, but it is a manual focus-only lens and does not have image stabilization. That the Zeiss costs nearly 3x the Tamron's price will not be overlooked by most. I often find that a camera manufacturer's own brand lens will deliver the best AF experience, but ... the Tamron 90 VC has worked quite well for me in this regard. You will pay less for the Tamron and it will be hard to justify the same-as-camera-brand option from an image quality perspective. The Sigma 105mm OS Macro Lens is a definite challenger from an image quality perspective, though it shows flare more readily. 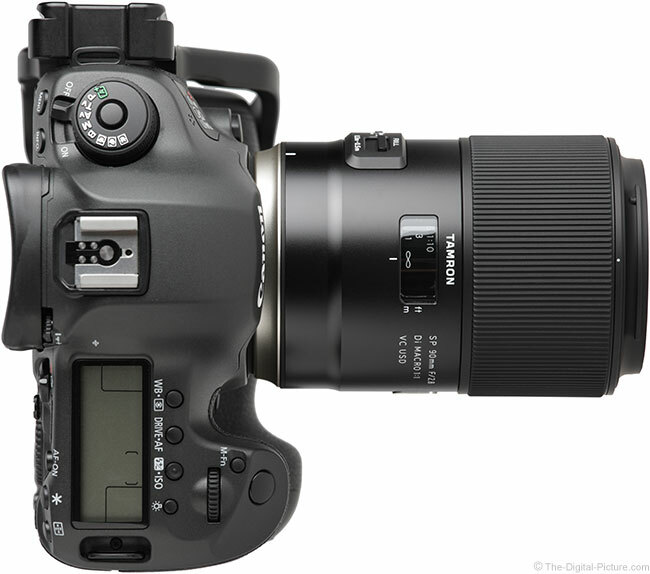 I prefer the Tamron's VC system to the Sigma's OS implementation. Offering a $350 instant rebate on this lens at review time, Sigma is apparently feeling some price pressure on this lens' significantly higher regular street price. 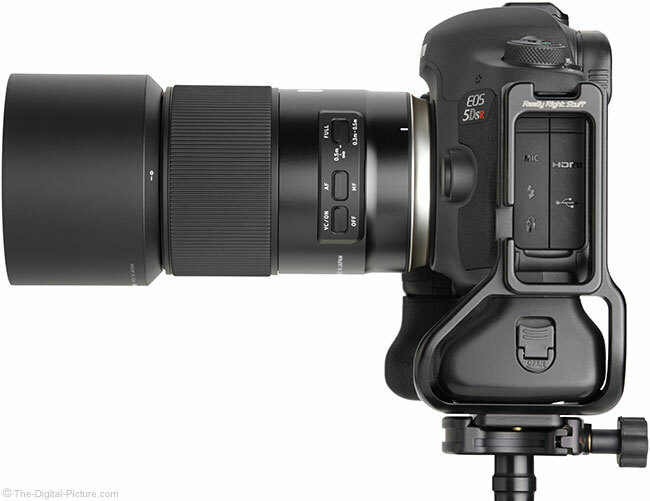 With the rebate factored in, the Sigma is priced modestly below the Tamron. I lean toward the Tamron slightly in preference between these two. A comment I should make is that the Tamron 90mm f/2.8 Di VC USD Macro Lens (model F017) performs noticeably better than its predecessor with the same name, at least at the wide end. The big image quality difference disappears within a stop or two, so if f/2.8 is not needed, the upgrade will be harder to justify from an image quality perspective. The new lens is nicer in many regards. Tamron got this lens right. The 90mm f/2.8 VC Lens is well-built with an also-high score for style. It delivers great image quality and has an affordable price tag. Of course, being a macro lens, great subjects abound for the 90 VC and great fun is sure to be had while using it. Especially great fun is viewing and sharing the results. Unleash your inner artist with the versatility this great value lens adds to your kit.